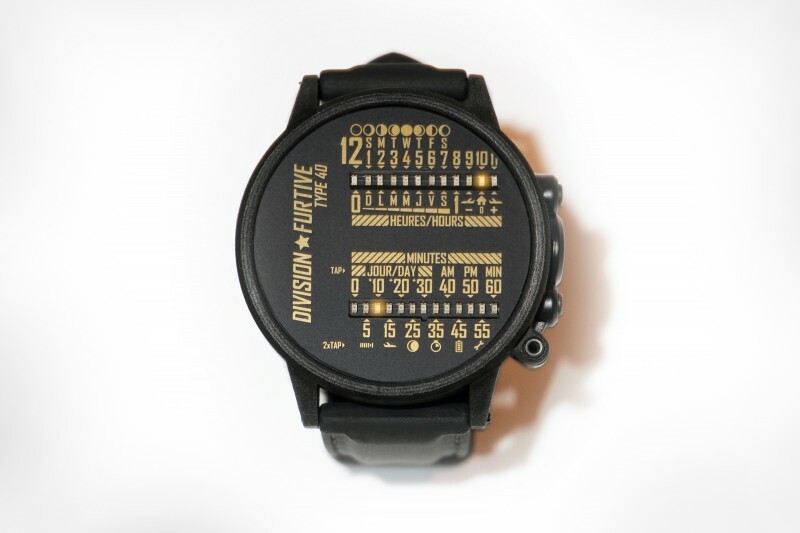 Type 77 is a new series of devices from Division Furtive. Each device has its particular function and internal construction. 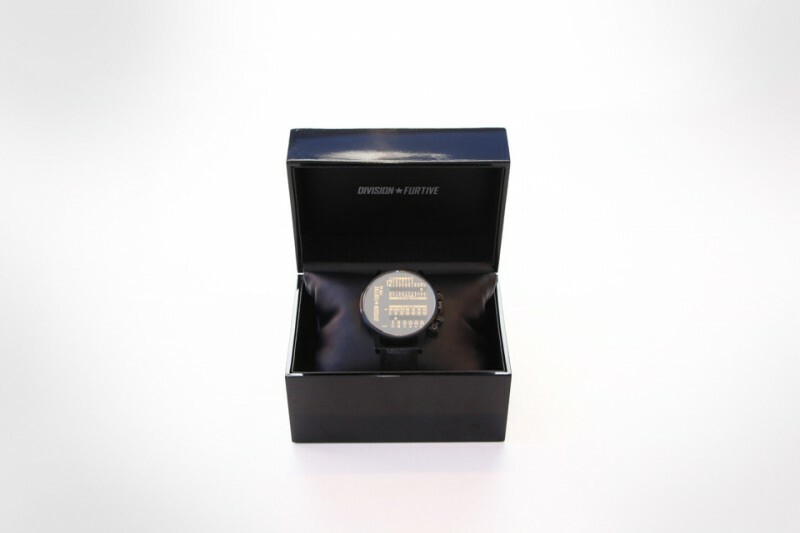 For the initial launch, four devices are offered: the Type 77.TIME timepiece, the Type 77.MOVE fitness tracker, the Type 77.CUBE wrist-fidget and the Type 77.MAZE wrist-game. 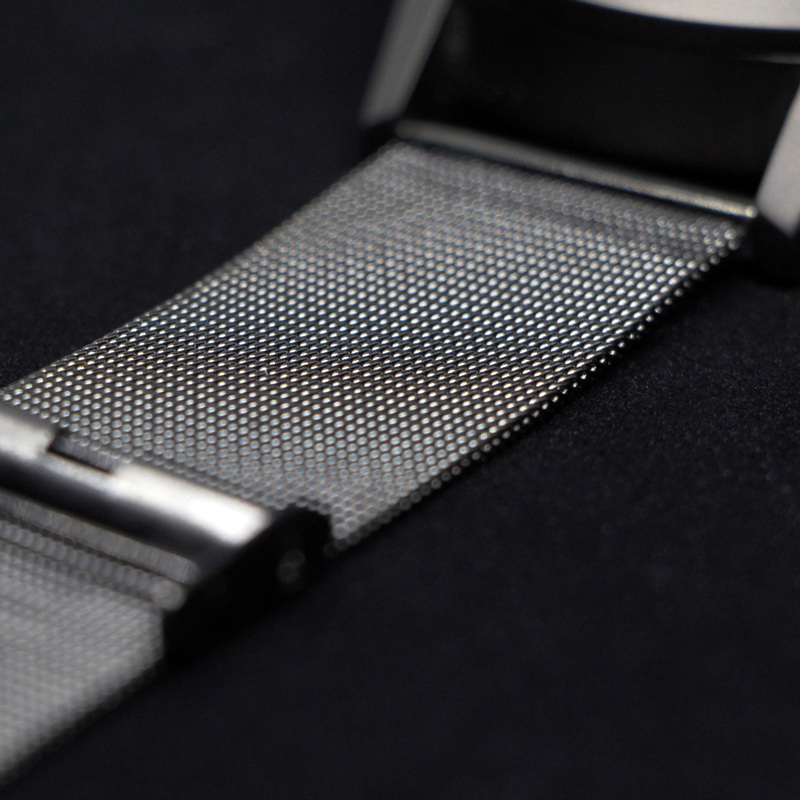 Across the Type 77 series, all the titanium casings are identical and have the the same available finishes. 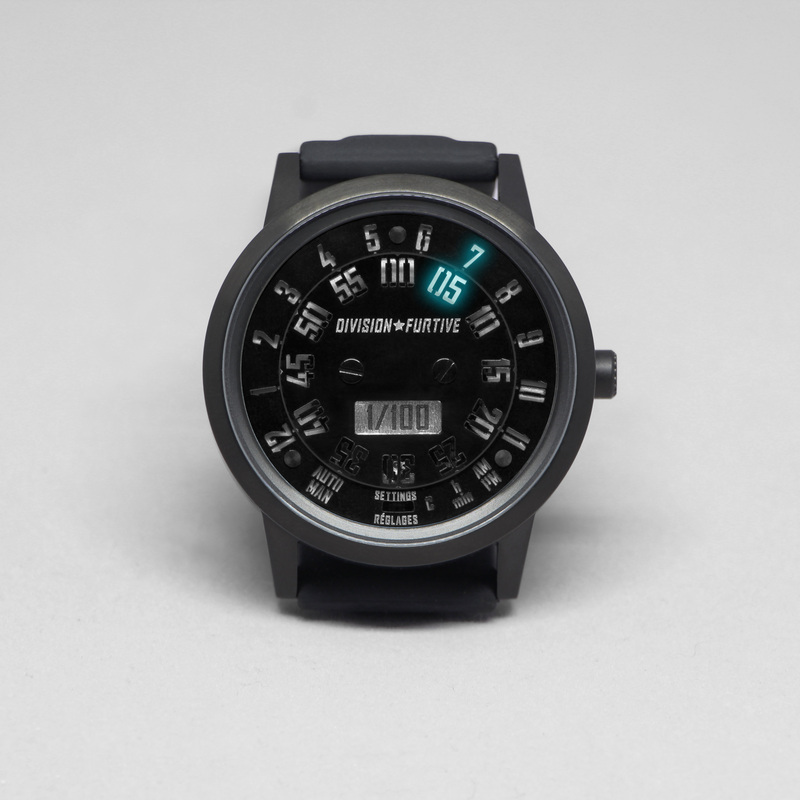 Initially four finishes are available: brushed titanium, matte titanium, brushed titanium with black PVD and matte titanium with black PVD. Production is limited to a total of 100 units per device. 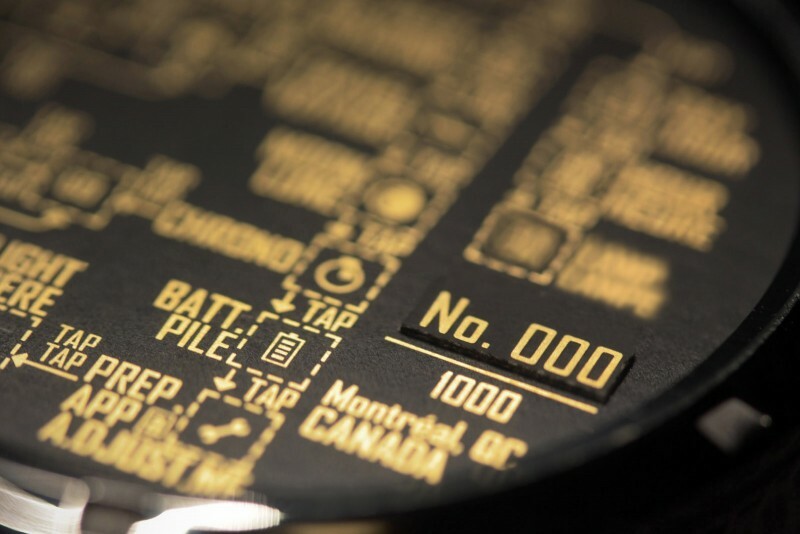 Each Type 77 device sports the 1/100 serial number as a symbol of its uniqueness. Specific serial numbers and customization are not available. The devices are offered for presale for a period of 30 days starting on August 30th, 2017. Depending on the selected device, production time will take between 6 and 12 months. You are invited to follow the progress of the production on Division Furtive’s Instagram, Facebook or Twitter page were updates will be posted frequently. The presale is essential to the completion of the series and presale prices are therefore aggressively discounted to ensure the greatest level of participation in this important phase of the project. 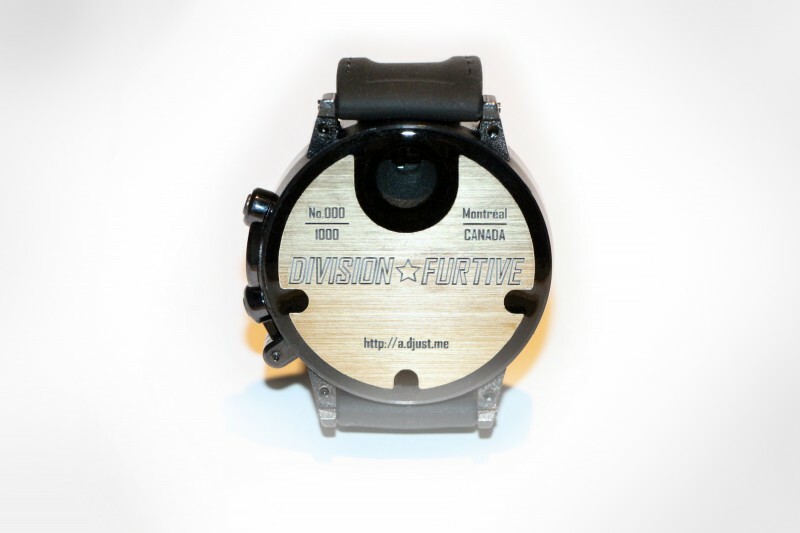 Division Furtive has an history of successful crowdfunding projects. You can see these below (Type 50, Type 46 and Type 40). See the Type 77 animated GIFs gallery. Download the press kit with high-resolution pictures. Type 77.TIME is an electro-mechanical timepiece. 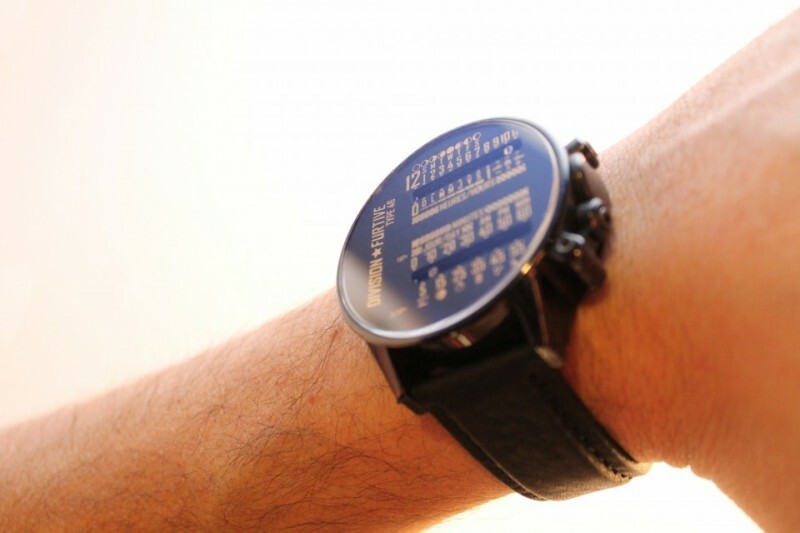 When triggered by the user (either by wrist rotation motion in AUTO mode or by pushing the crown in MAN mode), the watch displays time for 15 seconds. 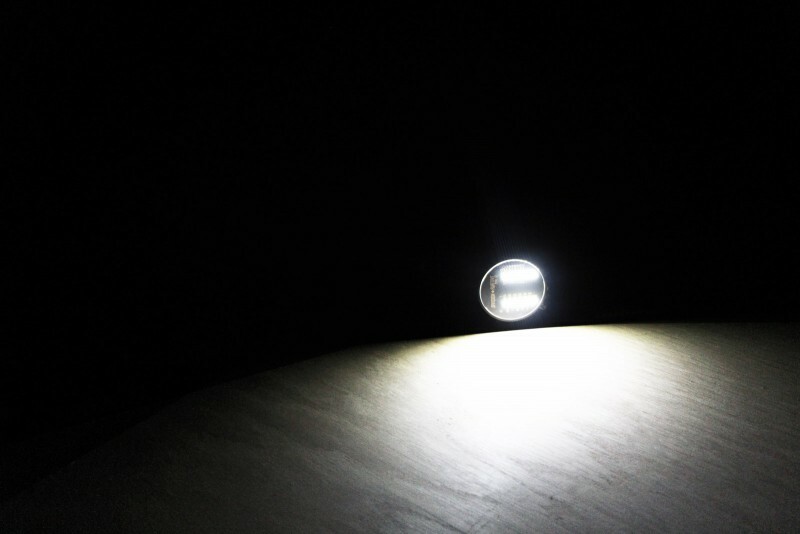 The hours are static and illuminated by one of the twelve individual RGB LEDs. The minutes are on the center revolving disc and align with the illuminated hour to display current time. The user can select the RGB LED color either manually or with an optic live color picker. The optic live color picker is particularly well suited to detect non-glossy uniform colors from clothing. Visit the Type 77.TIME high-resolution gallery. 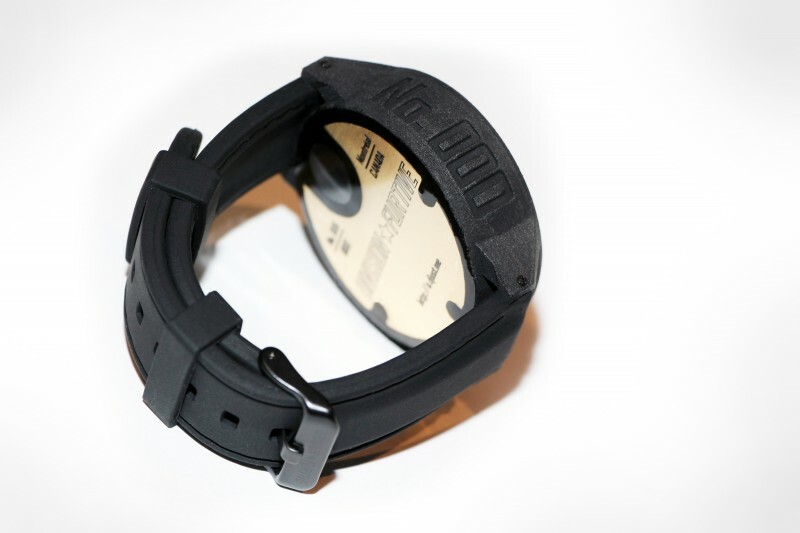 Type 77.MOVE is an electro-mechanical fitness tracker. When triggered by the user (by pushing the crown), the device displays the user’s activity level on a scale of 1 to 12 (1 is inactive and 12 is very active). The activity level is illuminated by twelve individual RGB LEDs. When the activity level is low (user has been idle for a while) the mechanical gears of the device move to notify the user. The user can select the RGB LED color either manually or with an automatic live color picker. The automatic live color picker is particularly well suited to detect non-glossy uniform colors from clothing. Visit the Type 77.MOVE high-resolution gallery. Type 77.CUBE is a silent wrist-fidget. The device is paired to an external cube that allows the user to control the inner cube with uncanny precision. The inner operating surface is made of copper and is CNC-machined with precision. Words can hardly express the level of control the device gives to its user…watch this video to see how this device operates. The device does not require batteries and operates only using magnetic fields. Visit the Type 77.CUBE high-resolution gallery. 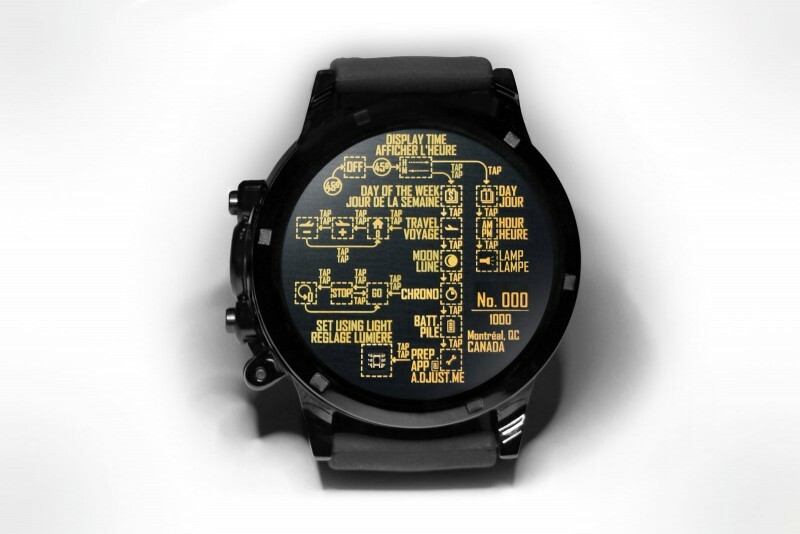 Type 77.MAZE is a wrist-game. The device consist of a single maze level but is extremely challenging to complete. The maze is made of aluminum and is CNC-machined with precision. The ball track is etched by laser. The device does not require batteries. Visit the Type 77.MAZE high-resolution gallery. 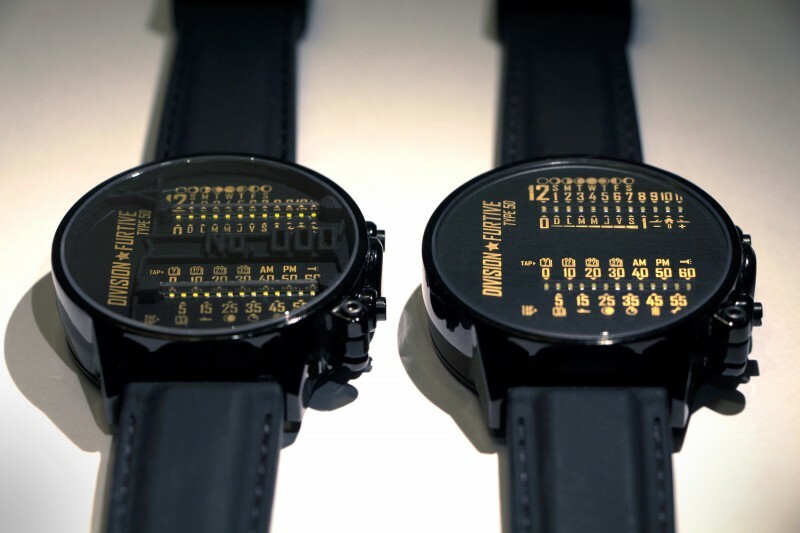 A dual linear LED-display watch. 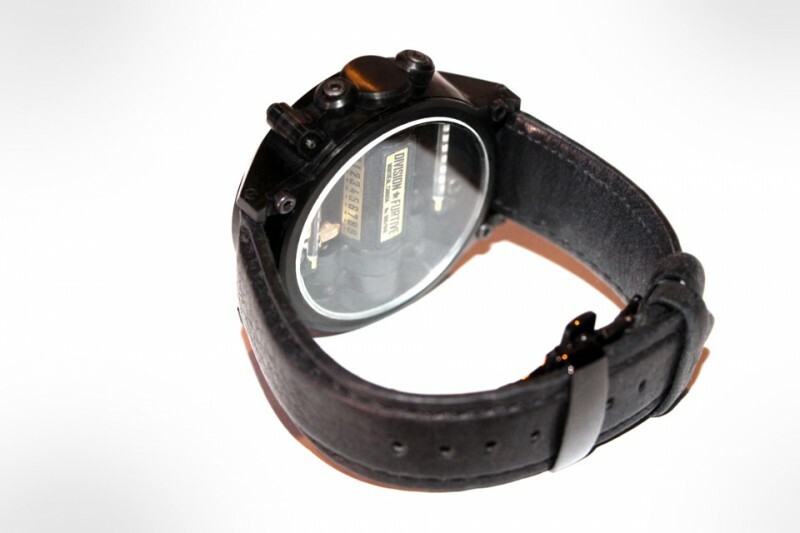 Based on the Type 40 design but with a metal casing, white LEDs and a new flashlight function. Production limited to 1000 units. Buy Now. 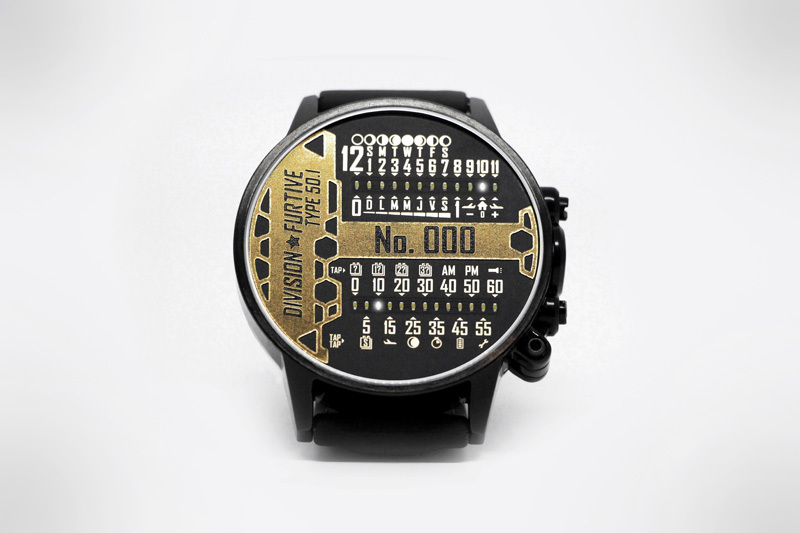 Each Type 50 watch sports its unique serial number (No. 001 to N0. 1000). 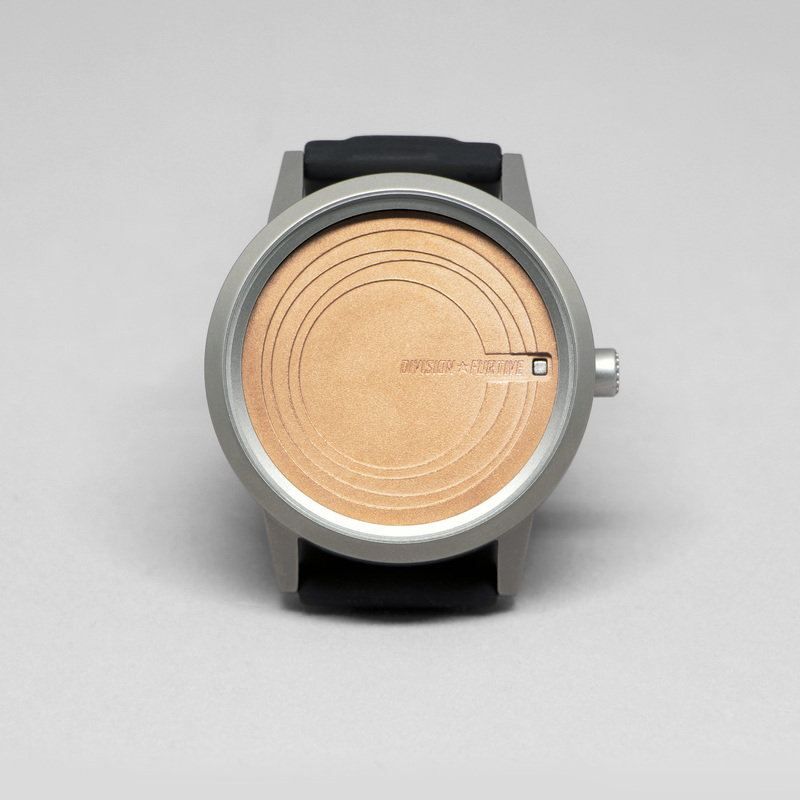 The watch was officially introduced on Kickstarter where sufficient units have been pre-ordered to launch production. Watch the Kickstarter campaign presentation video, watch the instruction videos or visit the Type 50 high-resolution gallery. 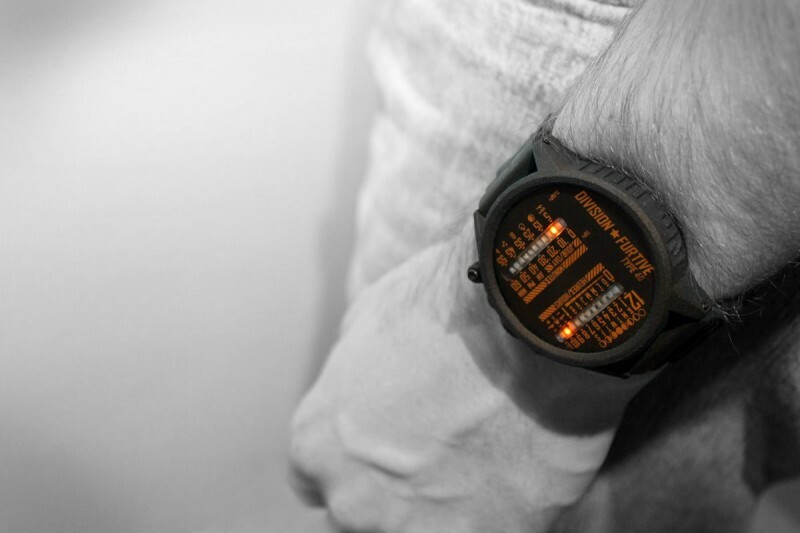 When the watch is in reading mode, meaning the watch has detected a wrist rotation gesture, the cursors quickly move to show the current time. At this point, the upper cursor shows the hours and the lower cursor, the minutes. Minutes are displayed precisely by one or two pulses of the bottow cursor, to the left (-1 min./-2 min.) or to the right (+1 min./+2 min.) of the closest 5-minute mutliple. When the minutes are an even multiple of five, the bottom cursor is static. 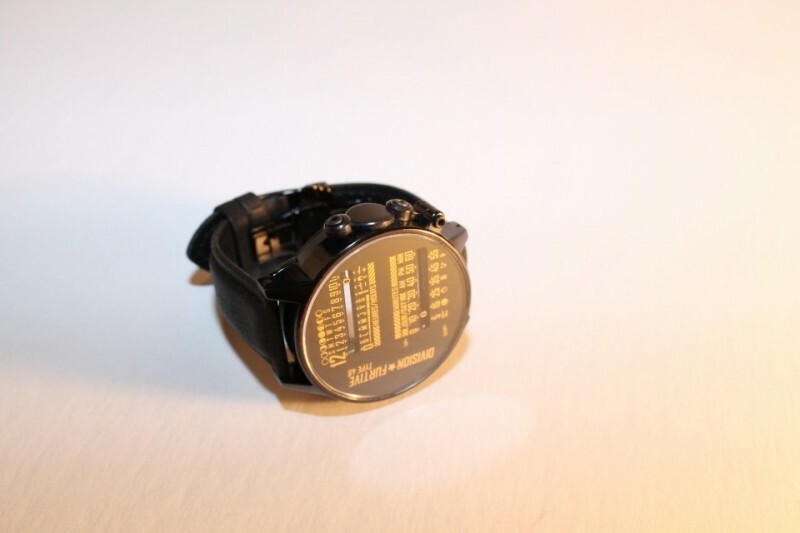 The watch sports no buttons: to activate the secondary functions, the user must tap (or double-tap depending on the desired function to activate) the front glass. 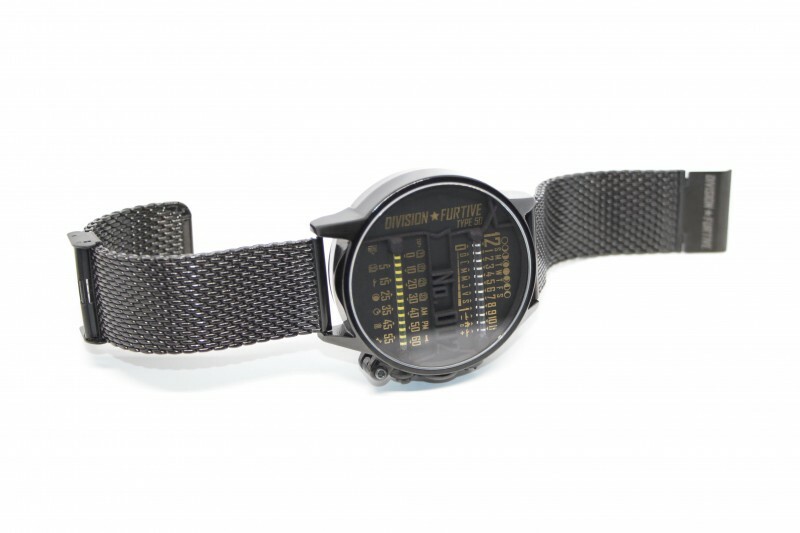 The watch can only be set by the light from your smartphone or computer display (see a demo here). Programming device must be a recent smartphone or LCD screen (some screen calibration/adjustment may be required and must be web-enabled). Because of this, the watch can support advanced calendar features like moon phases and automatic date change (including leap-year calculation). *Orders are submitted in CAD and converted to your local currency by your credit card. 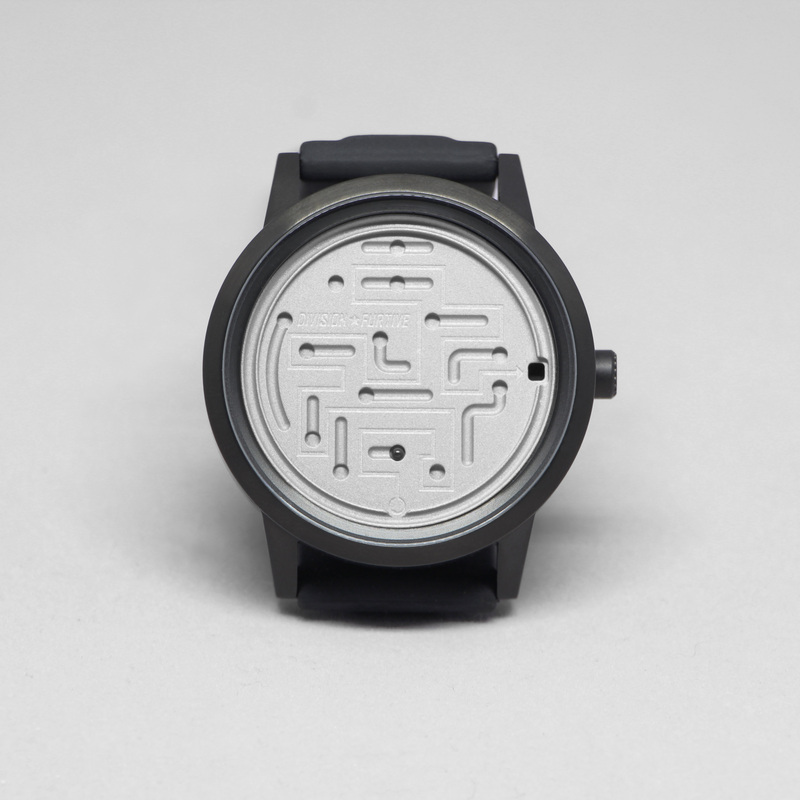 The Type 50.1 is a subset of the Type 50 production but with new dial design that includes a front-facing serial number. 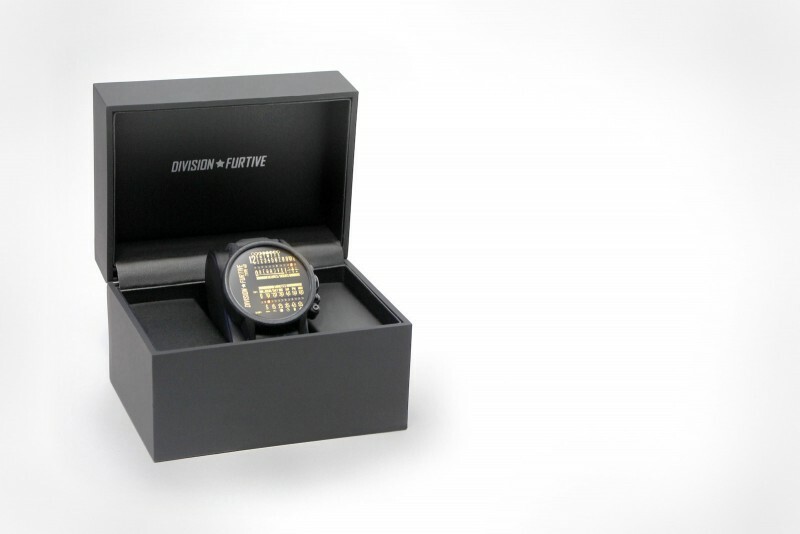 The overall Type 50 production is limited to 1000 units (meaning the total production of Type 50 + Type 50X + Type 50.1 = 1000 units), each Type 50.1 watch therefore sports its unique serial number from 1 to 1000. 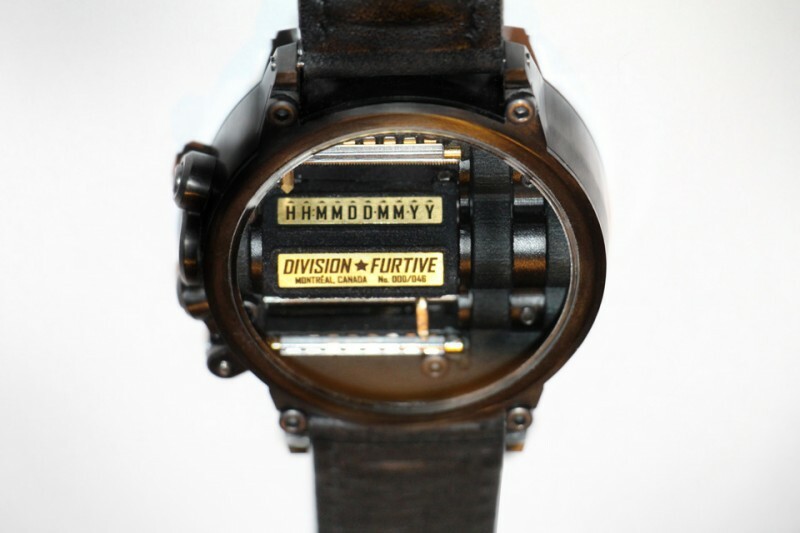 The Division Furtive Type 50.1 watch operates exactly the same way as the standard Type 50 and has all the same features. View the Type 50.1 high-resolution gallery. 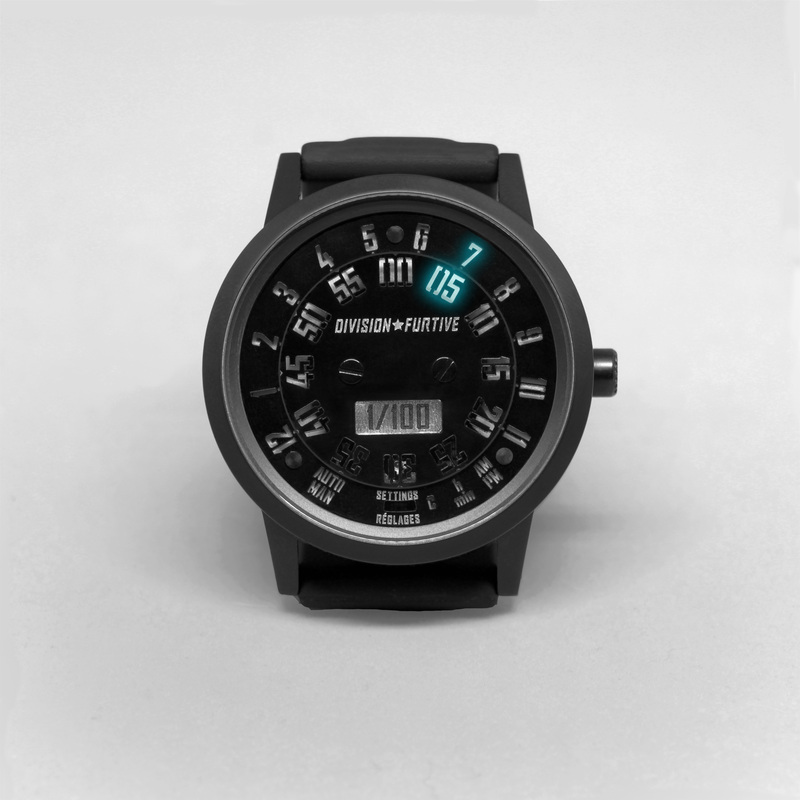 The Type 50 Extreme Edition (or Type 50X) is a subset of the Type 50 production with the “flux capacitor” dial. 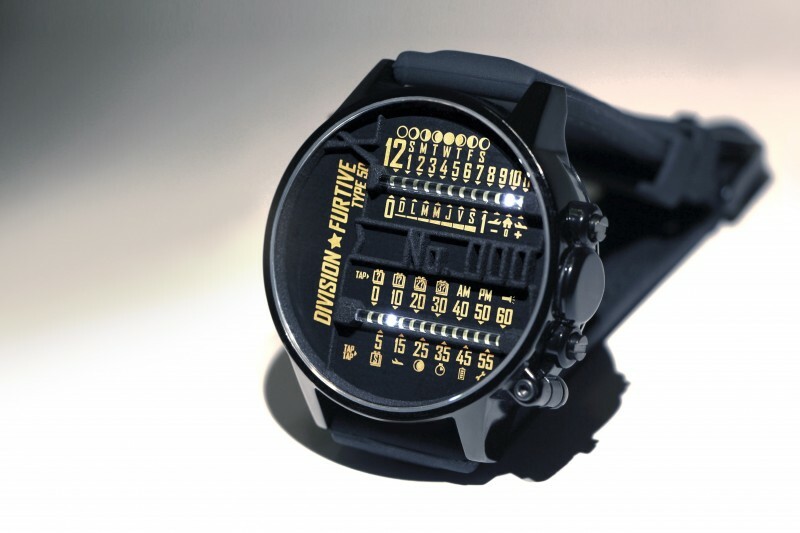 This dial as a deeper perspective and sports the serial number in bold 3D characters. 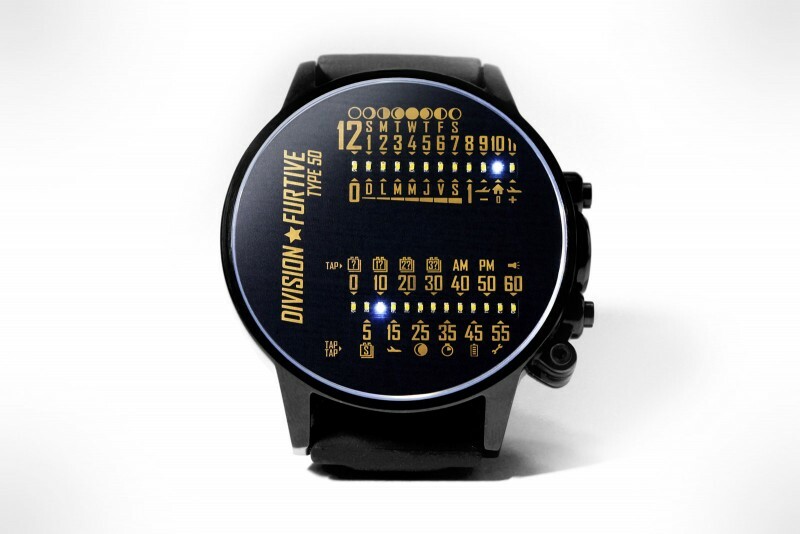 The Division Furtive Type 50 Extreme Edition watch operates exactly the same way as the standard Type 50 and has all the same features. However, because the dial sits lower, the battery is a AAAA instead of AAA. Because of this, the power reserve is 40% less than the standard Type 50. 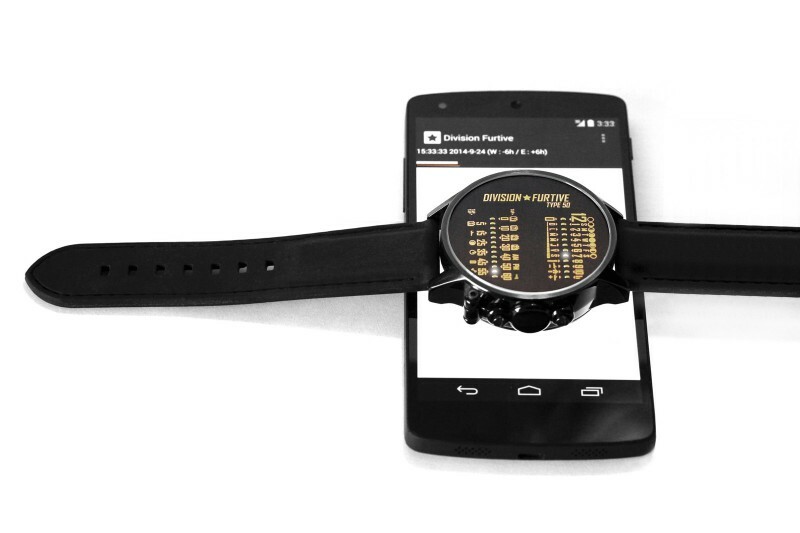 The watch can only be set by the light from your smartphone or computer display (see a demo here). Programming device must be a recent smartphone or LCD screen (some screen calibration/adjustment may be required and must be web-enabled. Because of this, the watch can support advanced calendar features like moon phases and automatic date change (including leap-year calculation). A dual linear movement electromechanical watch. 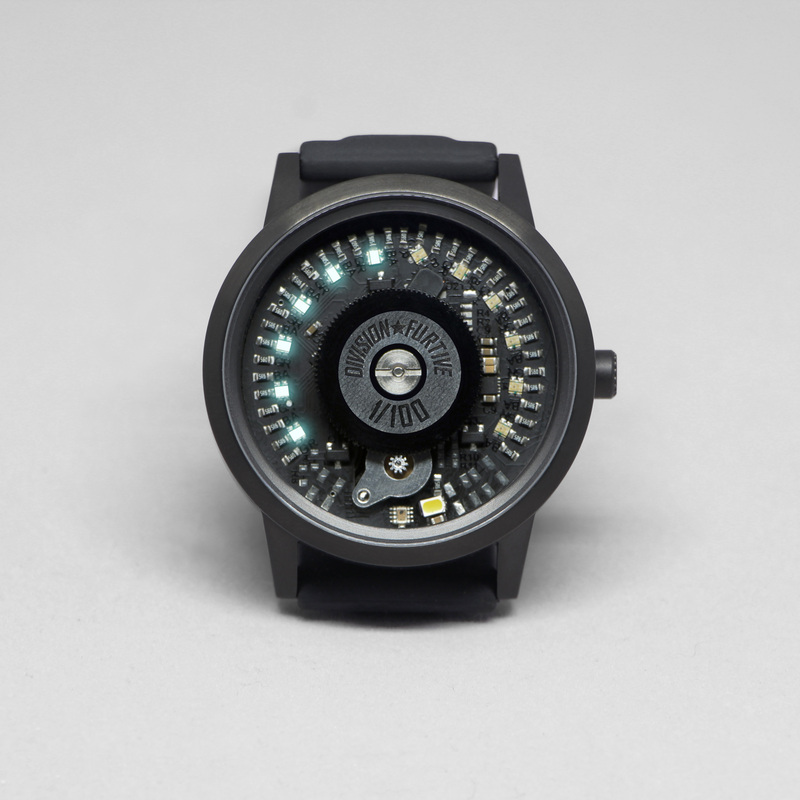 Built from scratch (movement and casing), the production of this watch is limited to 46 units. 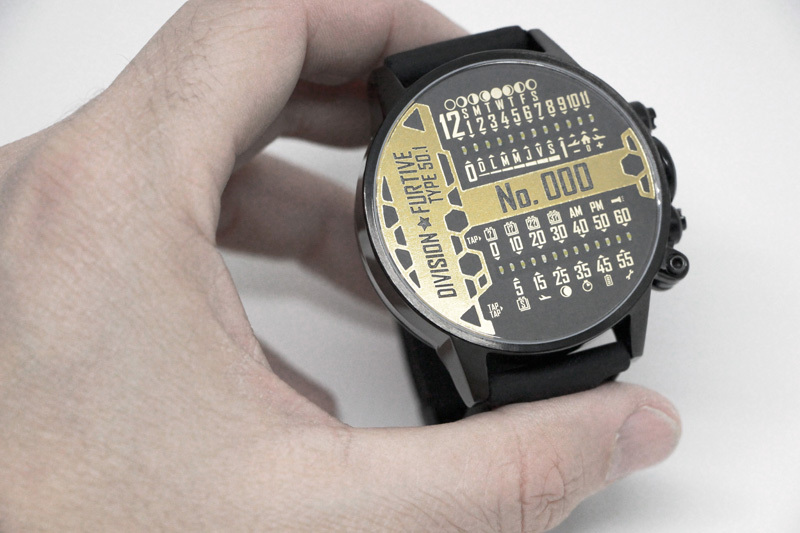 The watch was officially introduced on Kickstarter where almost all units from the future production were reserved. Watch the Kickstarter campaign presentation video or visit the Type 46 high-resolution gallery. 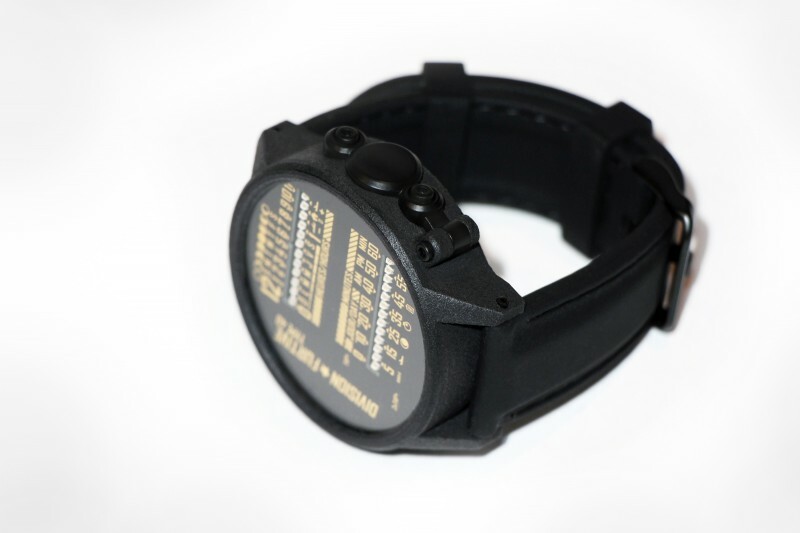 When the watch is in reading mode, meaning in front of the user at and angle of about 45°, the cursors quickly move to show the current time. At this point, the upper cursor shows the hours and the lower cursor, the minutes. 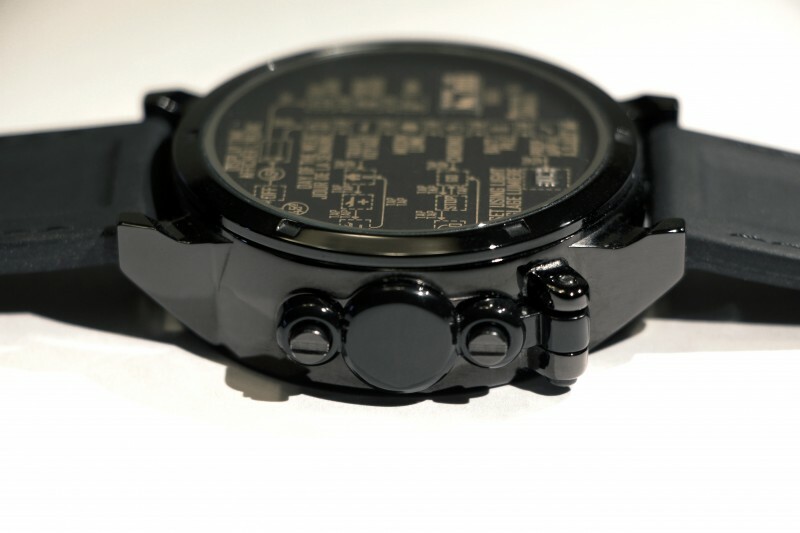 The watch sports no buttons: to activate the secondary functions, the user must tap (or double-tap) the front sapphire crystal. 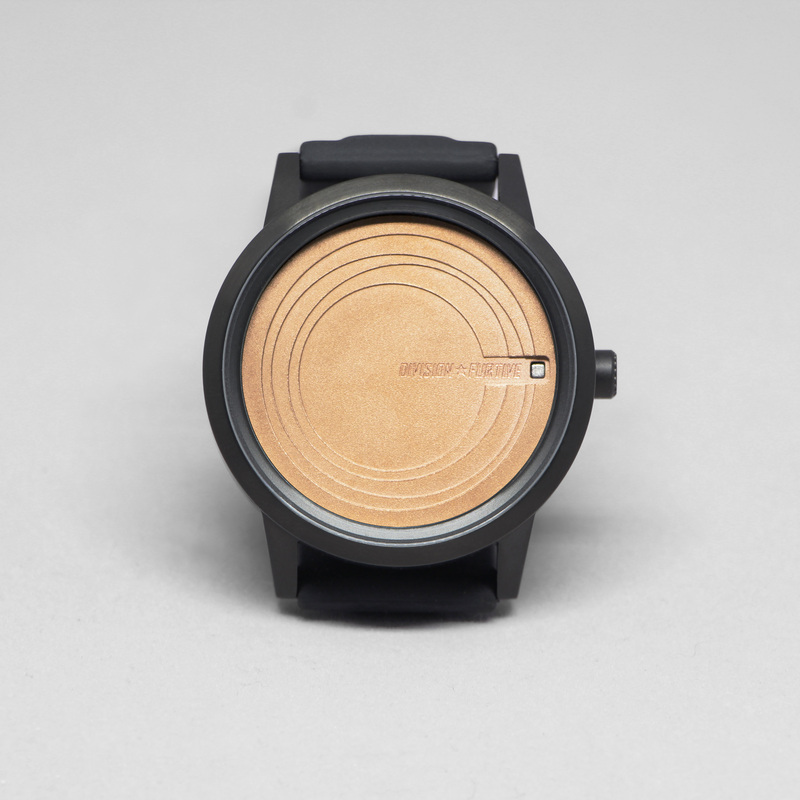 The watch can be set by light signals from your smartphone or computer display. Programming device must be a recent smartphone or LCD screen (some screen calibration/adjustment may be required) and must be web-enabled. Because of this, the watch can support advanced calendar features like moon phases and automatic date change (including leap-year calculation). 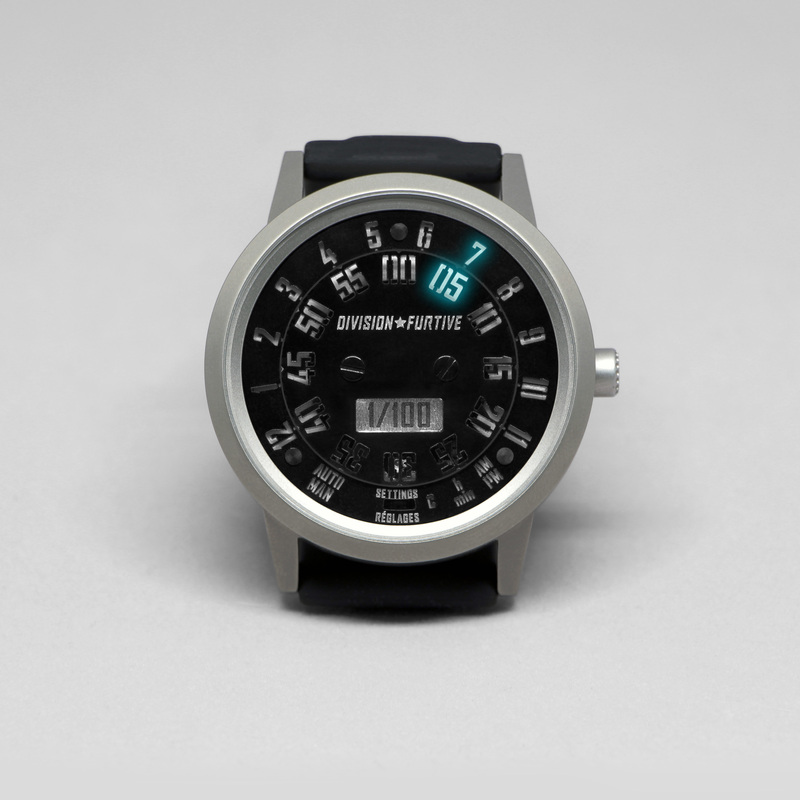 The watch can also be set by using the third scale on the back of the watch and the tap/double-tap gestures. 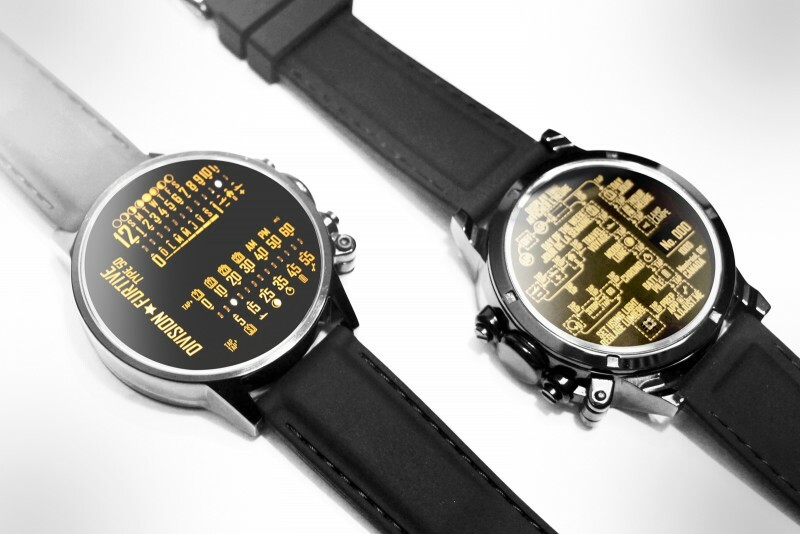 A dual linear LED-display watch. Based on the Type 46 design and production limited to 1000 units. Inspired by the Type 46 design but built for action and robustness. The Type 46’s metal casing is replaced by an equally-sized, epoxy-filled plastic structure. The mechanical cursors are replaced by bright amber LEDs. 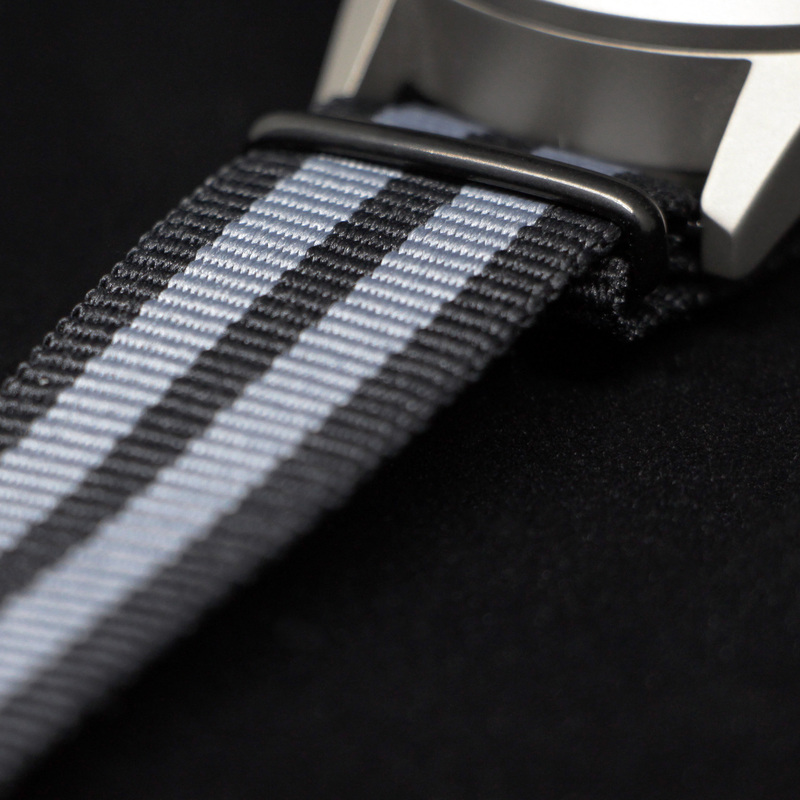 This makes for an incredibly durable watch with a nice feel. 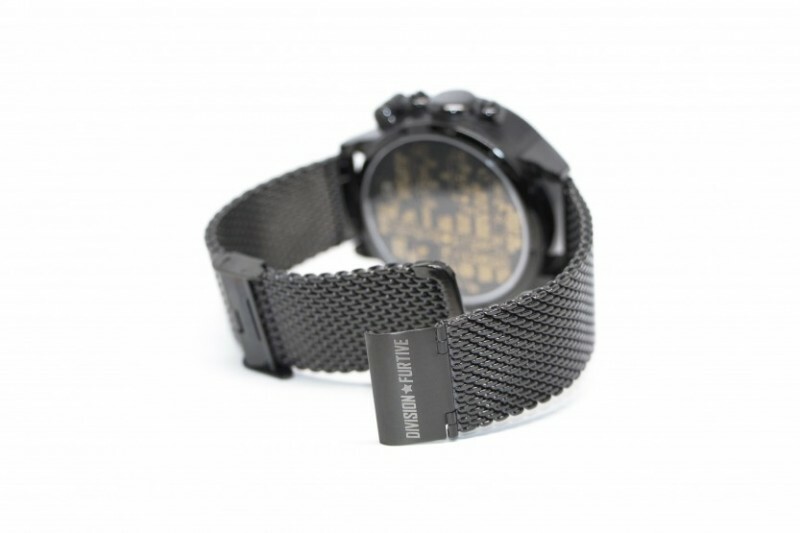 Each Type 40 watch sports a boldly marked serial number on its left side (No. 001 to N0. 1000). 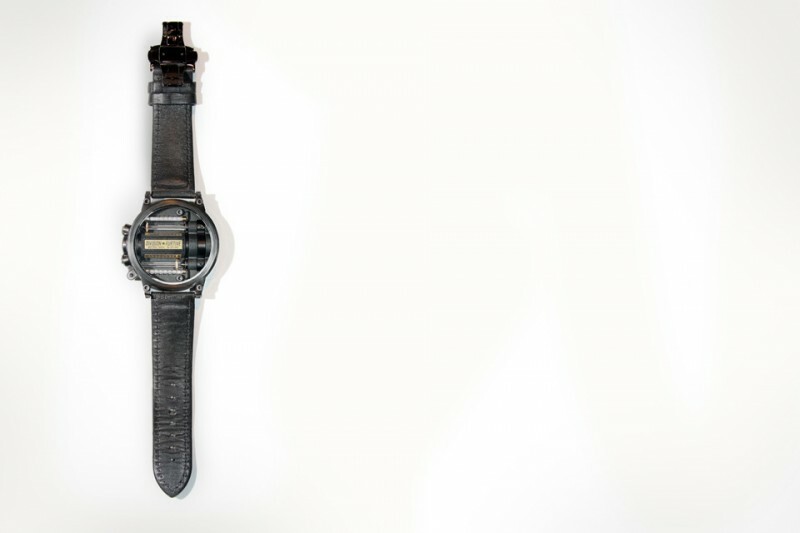 Watch the Kickstarter campaign presentation video or visit the Type 40 high-resolution gallery. 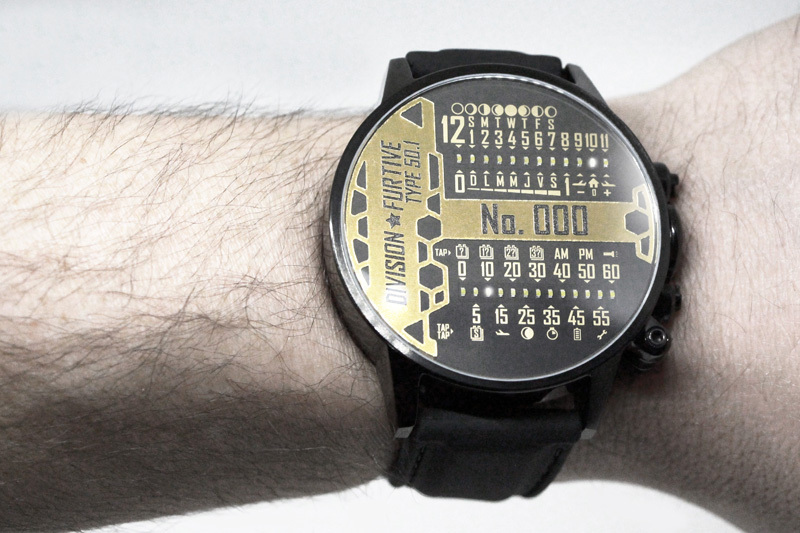 When the watch is in reading mode, meaning in front of the user at and angle of about 45°, the cursors quickly move to show the current time. At this point, the upper cursor shows the hours and the lower cursor, the minutes. Minutes are displayed precisely by one or two pulses of the bottow cursor, to the left (-1 min./-2 min.) or to the right (+1 min./+2 min.) of the closest 5-minute mutliple. When the minutes are an even multiple of five, the bottom cursor is static. 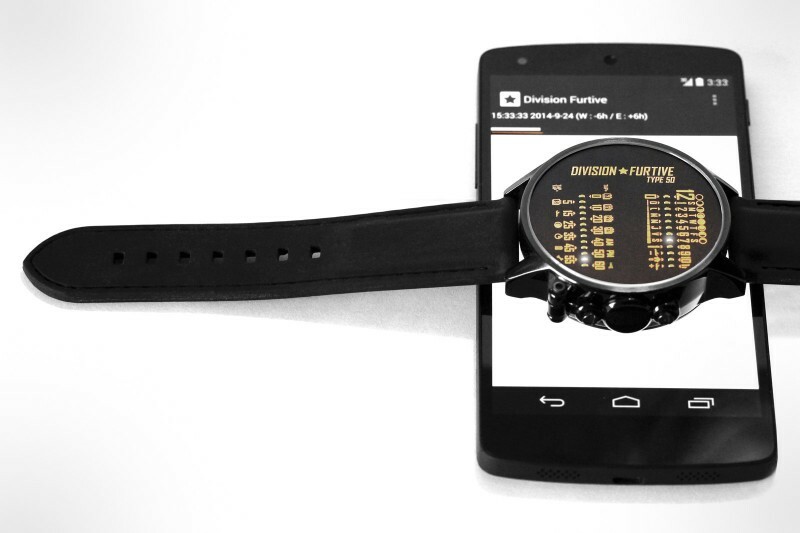 The watch sports no buttons: to activate the secondary functions, the user must tap (or double-tap) the front glass. 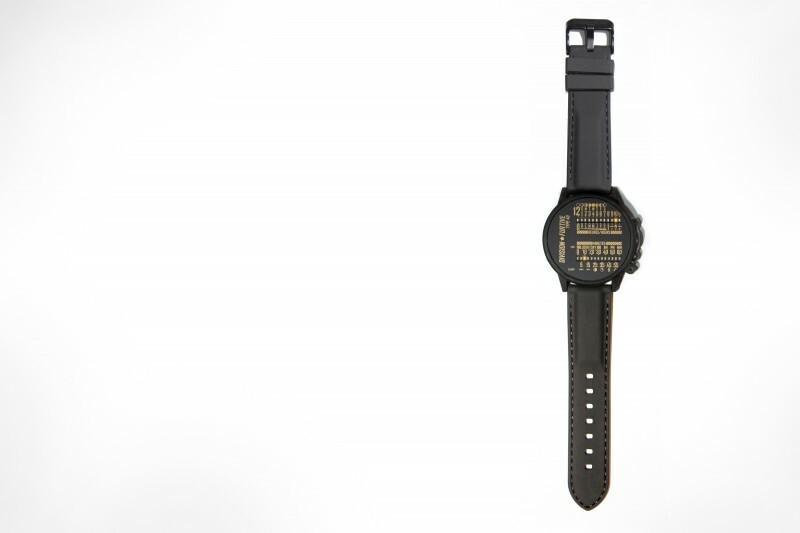 The watch can only be set by the light from your smartphone or computer display. Programming device must be a recent smartphone or LCD screen (some screen calibration/adjustment may be required and must be web-enabled. Because of this, the watch can support advanced calendar features like moon phases and automatic date change (including leap-year calculation). Watch the Type 40 introduction video. See important notes for Type 40 owners. This watch is based on the original Type 40 design but is made with a sterling silver case with black ceramic coating and sapphire crystal. Production limited to 15 units only! 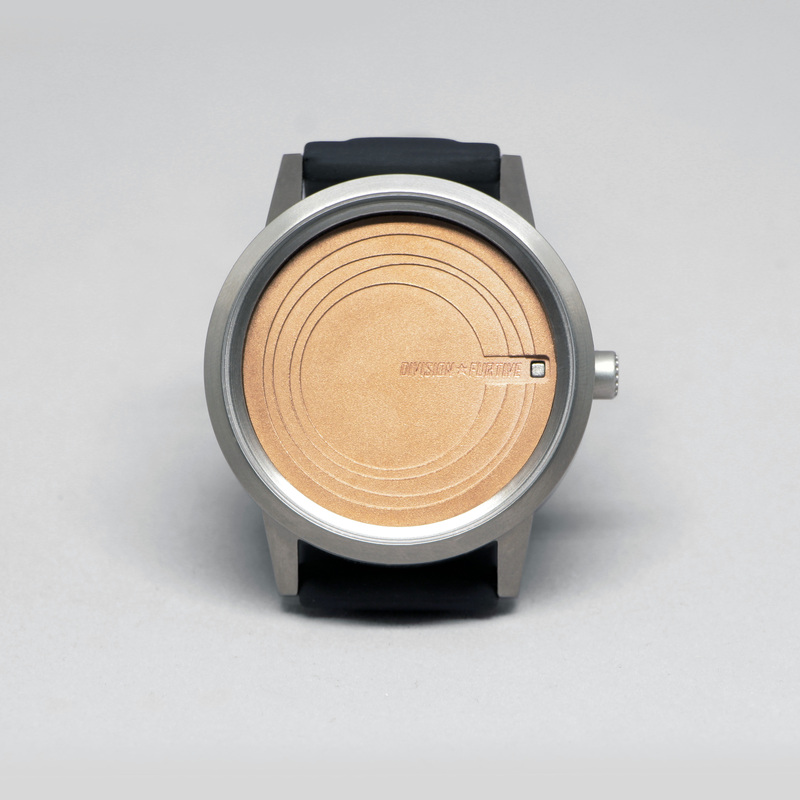 Note the Silver Edition does not have its serial number carved on the side of the watch, only underneath the watch. 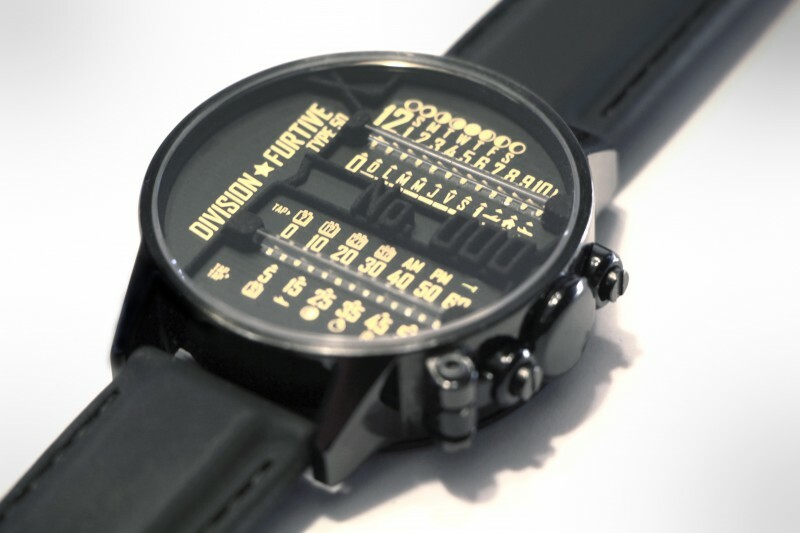 The Division Furtive Type 40 Silver Edition watch operates exactly the same way as the original Type 40 and has all the same features. 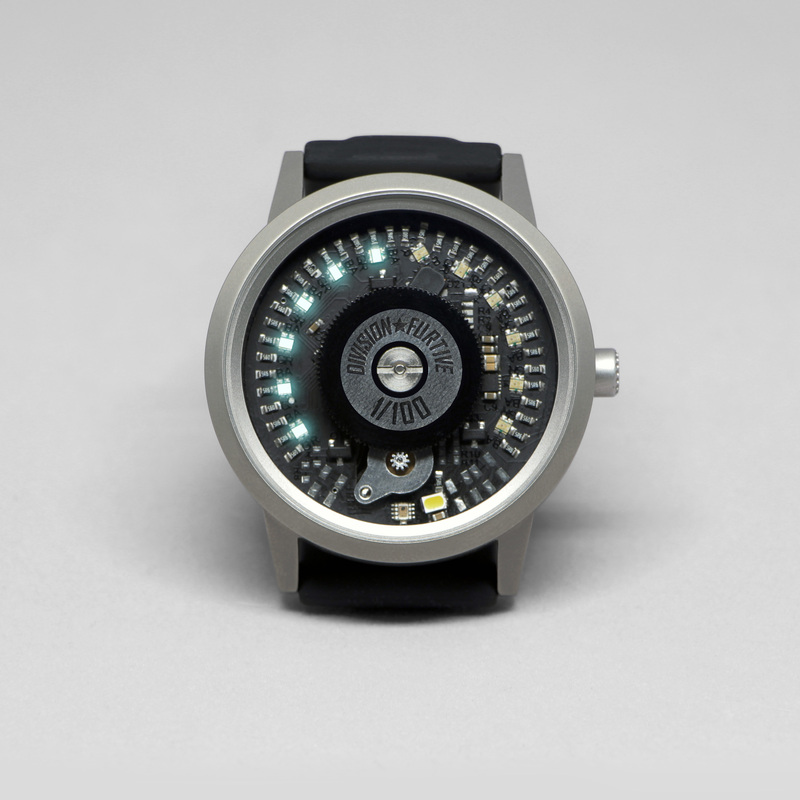 The watch can only be set by the light from your smartphone or computer display. Programming device must be a recent smartphone or LCD screen (some screen calibration/adjustment may be required and must be web-enabled. Because of this, the watch can support advanced calendar features like moon phases and automatic date change (including leap-year calculation). 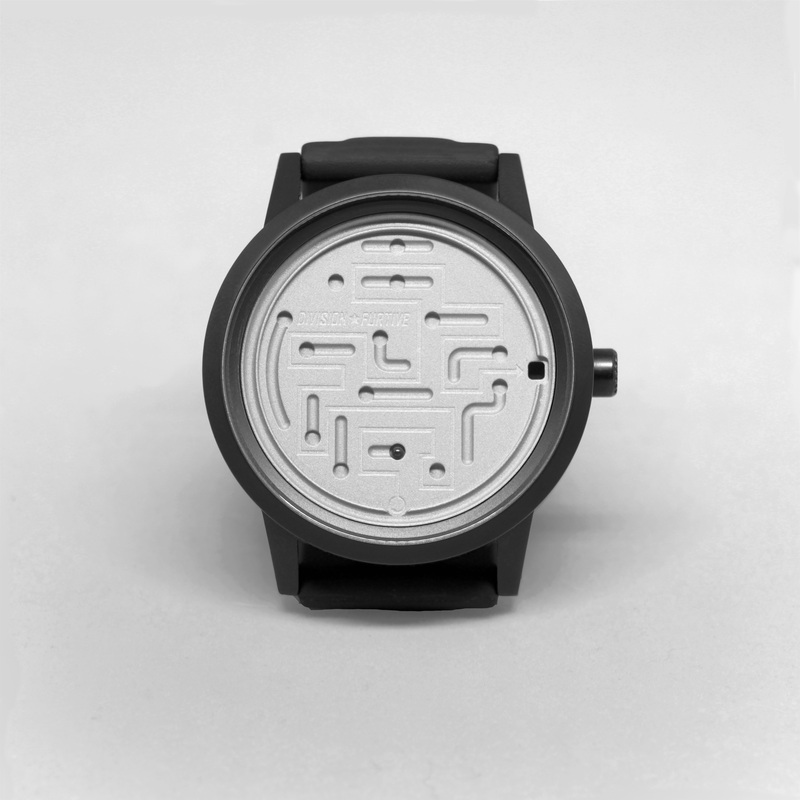 Timepieces offered in limited production runs. Built one by one in Montreal. When setting your watch, chances are you fetch time from your computer or cellphone…why not let this very device program your watch? 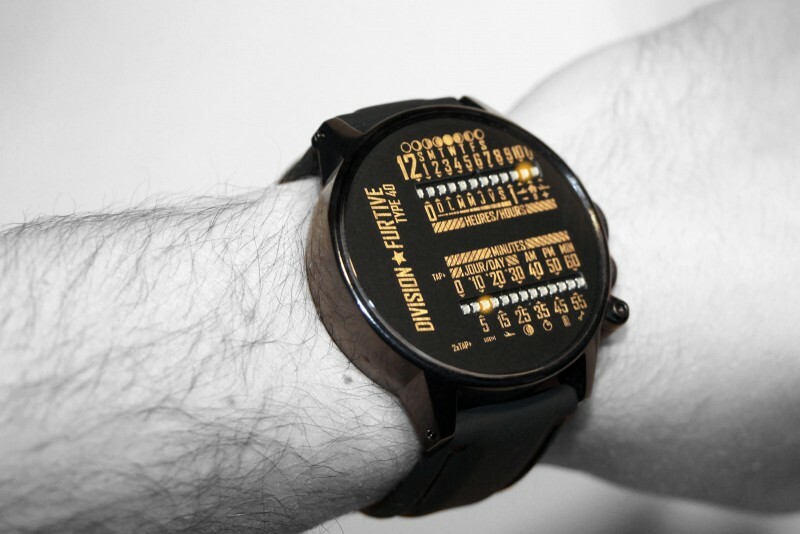 With this idea in mind, all Division Furtive watches can be set by light signals from your smartphone or computer displays. Programming device must be a recent smartphone or LCD screen and must be web-enabled (except for the Android app that works offline). 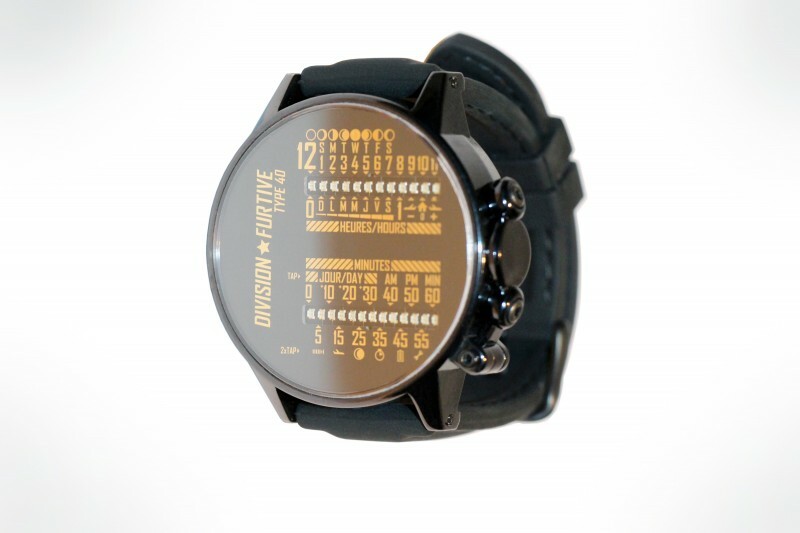 Because of this, the watch supports advanced calendar features like moon phases and leap-year calculation with one simple programming procedure. • Make sure you have read the operating instructions for Type 40 (pdf), Type 46 (printed manual) or Type 50 (pdf). There is also an video instruction manual for the Type 50. • Set brightness (and contrast) of your programming device to maximum. • Android users, install the app below for best experience. • PC/Mac/iPhone/Windows Phone/BlackBerry users, click the link below to launch the web app. Division Furtive has ceased all operations. 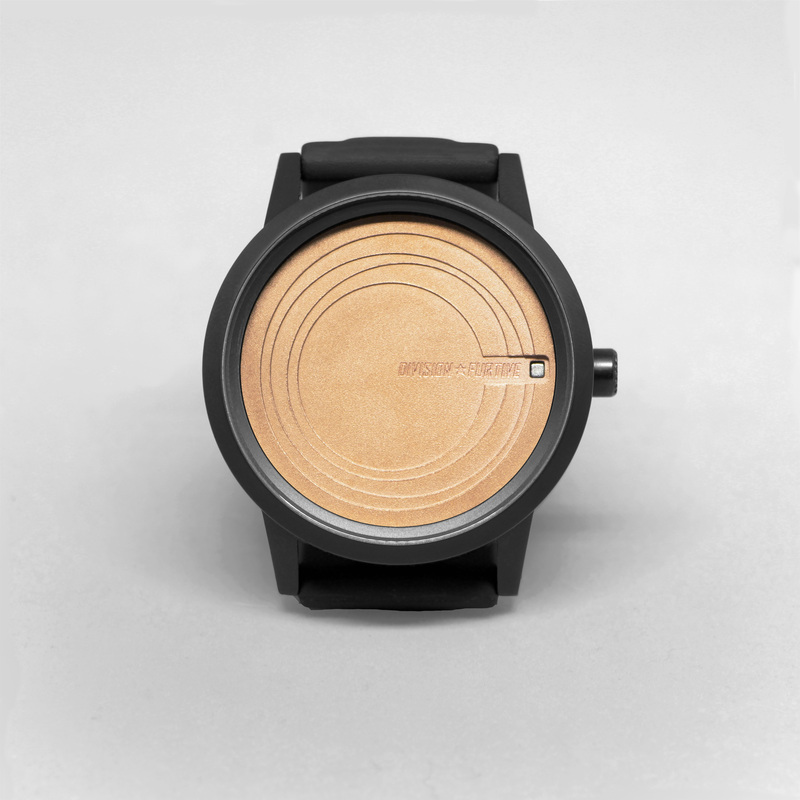 The website will remain online in order for collectors to set their watch. 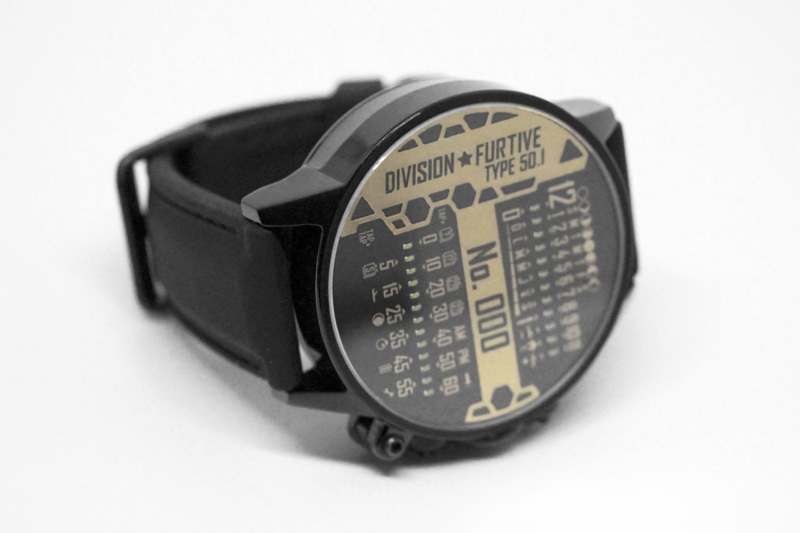 Division Furtive watch owners, please read the following tips and troubleshooting guide.